As time passed, another race of people arrived in Malta, the 'Phoenicians' with their arrival here, we passed from pre-history to HISTORY. the Phoenicians were people who lived to the north of Palestine. On a narrow strip of land between the mountains of Lebanon and the Mediterranean Sea. There were many cedar trees in Lebanon, and their timber was very good for shipbuilding. It is not surprising there­fore, that they had an attraction for the sea. Moreover, the position of their land to the east of the Great Sea was very suitable for trade with the business centres of the East (like Mesopotamia) and Egypt as well as with the countries on the shore of this sea later called the Mediterranean Sea. Their homeland was fertile, but these people preferred their crafts to agriculture, for this reason they liked to go trading by means of ships and to emigrate, In this way they occupied islands and ports along their trade routes in the Mediterranean such as Cyprus, Northern Africa, Sicily, and, of course, Malta, They were able to make beautiful things, the Bible tells us that these people helped Solomon to build the magnificent Temple of Jerusalem. As they travelled they got raw-materials for their own handiwork, copper from Cyprus, iron and tin from Britain, silver from Spain, fine linen from Egypt, perfumes and spices from Arabia, pearls from the East, and lion-skins from Africa. In their workshops at Tyre and Sodom, they manufactured pretty and useful objects of glass. Silver, bronze, and other materials, above all, they produced excellent linen-cloth, and then they dyed it a rich purple colour by nipping it several times into a kind of 'stain" obtained by boiling a sea-shell called 'murex' this purple linen became so famous throughout the known world. That even kings obtained it for their robes, in fact the colour is known as Royal Purple and even the church uses it for certain vestments. When the Greeks got to know these hardworking people they nicknamed them PHOENICIANS which means, people of the purple cloth. To keep up with such a lot of trade everywhere, and with so much selling, buying and exchanging, the Phoenicians invented a quick way of writing the names of things and of making bills. By the year 1.000 B.C. they had a complete set of 22 signs with which they could write the name of anything. Later, this set of signs was called ALPHABET. 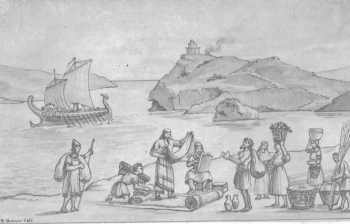 It is an interesting speculation whether the first Phoenician discoverers of Malta came from the east (Tyre), the south (Carthage) (§) or the north (Sicily). The fact that the Phoenician name for Malta was spelt MLT, meaning a shelter, rather suggests that its discovery was accidental, perhaps by a Tyrant ship on its way to Carthage, being blown into a Maltese harbour by stormy weather. we do not know how the Phoenicians pronounced MLT. 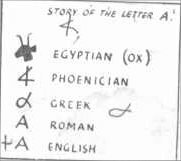 In company with other Semitic languages, Phoenician had no short vowels. MLT therefore, could have been pronounced Malet, Imlet, Melita or Malta. Mallet or Mallet seems likely as it would lead naturally to the Roman Melita. From a place of refuge, Malta became a flourishing Punic colony, an important port of call for the Phoenician ships trading between Levant and Mediterranean ports and westwards into the Atlantic, even as far as Britain. They adored many gods, they honoured Mekart as the guide of sailors and protector of trade, they kept Astarte as their sun-god to these and other gods, the Phoeni­cians used to offer sacrifices in the form of food and drink, birds and animals and sometime even human beings. Old historians mention the remains of a ruined temple to Melkart on the hills near Marsaxlokk. And another one dedicated to Astarte on the site where, today, there is Fort St. Angelo. Observe that both temples dominated the two important harbours of Malta in various places, man graves have been found these contained funereal furniture of earthenware and glass the tomb itself was dug out in the rock and consisted of a shaft often with steps leading to a small room where the dead person was laid, sometimes. A stone or clay coffin was used, while jars and ornaments were left in the tomb, these show that the Phoenicians believed in some sort of journey to eternity. About the year 1697, two small columns, or pillars, of marble were discovered in the Temple of Melkart each was exactly like the other and, on their cubic base, each had an inscription in Phoenician and Greek, two brothers, Abdosir and Osirxamar had made a vow to Melkart to beg his protection and safety during their voyage on their safe arrival here, they made these two fine pil­lars. 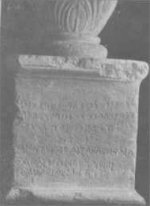 Unfortunately, only one of them has been kept in Malta, and it may be seen in the Phoenician hall at our National Museum in Valletta, the other was presented as a gift to the King of France by Grand Master De Rohan, the inscription is of a great im­portance because it gave us the key to the Phoenician alphabet, in which each letter shows a sound and not a picture of a thing.